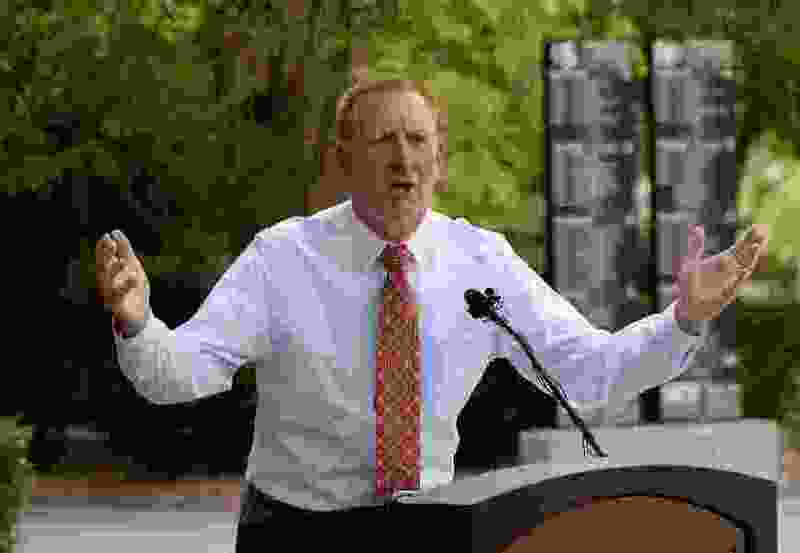 (Francisco Kjolseth | The Salt Lake Tribune) An animated former Salt Lake County Sheriff Jim Winder calls out a lack of leadership in the current sheriff Rosie Rivera and blasted the cities that are trying to flee the United Police Department during a press event outside the Salt Lake City and County building on Tuesday, July 31, 2018. Without naming Salt Lake County Sheriff Rosie Rivera, ex-Sheriff Jim Winder blasted his successor for a lack of leadership in jumping in to stop the hemorrhage of cities from the Unified Police Department. “A strong sheriff needs to fight” to keep the consolidated law enforcement agency together, said Winder, warning of diminished public safety and higher costs if it unravels. One of the founders of UPD, Winder, now police chief of Moab, acknowledged that he hadn’t talked to Rivera about his criticisms before calling a news conference Tuesday afternoon to air them publicly. He declined to say why. Winder held the event a day after a state audit largely gave UPD a good bill of health, with some minor criticisms about its governance structure and transparency. Rivera countered Winder’s warnings by saying he has largely lost touch with what’s going on in the department since leaving 11 months ago. Rivera says Herriman has planned to leave UPD for two years, but Riverton, after recently signaling its departure, has paused that move. “We have an opportunity to keep Riverton, and we are fighting to keep Riverton,” said Rivera, Salt Lake County’s first female sheriff. A recent change by Rivera was to replace the chief financial officer of the past nine years, Scott Jurges, with a new one: Lisa Dudley, who is leaving her post as CFO of Riverton to take that job with UPD. It is one of the moves Rivera said the organization is undertaking to become more transparent. That was one of the criticisms of the state audit, and Rivera and UPD board Chairman Jeff Silvestrini, mayor of Millcreek, said they would take other steps toward more openness, including posting officer names and genders on the state’s financial disclosure website, along with UPD board member contacts, minutes and agendas. Rivera and Winder are Democrats, but Winder wouldn’t endorse Rivera on Tuesday. He also stopped short of calling for new leadership just months before Salt Lake County voters will pick a sheriff for the next four years. Facing Rivera in the Nov. 6 contest is Republican Justin Hoyal, a UPD lieutenant. Winder also castigated cities for fleeing UPD service — beginning with Cottonwood Heights in 2009. More recently, Herriman has begun steps to form its own department, and Riverton appears to be on the verge of doing so. “Cities are fleeing out of greed,” Winder charged, saying they believe they can withdraw cash and resources from UPD while it is financially strong, leaving a weaker, underfunded organization. “They want to go when the getting’s good." He said the agency could quickly and easily devolve into 20 police departments — a development he says would ill serve residents. “The sheriff better do their job” of holding UPD together, Winder said. Rivera said she was in a meeting with CFOs of several member cities and UPD command staffers when she was called away to listen to Winder’s news conference outside her office. Asked why Winder unleashed his criticisms publicly, Rivera said she didn’t know and hasn’t spoken to him since he left town for Moab, a southern Utah tourist mecca and gateway to two national parks. Why hasn’t she reached out to her old boss? “I felt he deserved to go get some peace,” she said, adding that she had hoped he could “move on” from his old job as sheriff in the state’s population center. Riverton Mayor Trent Staggs also rejected Winder’s criticism, saying in a prepared statement that it was “unfortunate” he “would make wild assertions that call into question the integrity and motivation of Riverton City.” He said exploration of forming its own police force or renegotiating its UPD contract is the city acting responsibly on behalf of taxpayers. “That is not ‘greed,'” Staggs said. He also suggested some hypocrisy in Winder’s allegations. “He himself left his post as one who oversaw UPD to go to a small city that self-provides law enforcement,” the mayor said.